Photos taken at the Class of 1964 luncheon hosted for the members of the 2014 Sandhurst team. On Monday 12 May, eight members of the Class of '64 gathered in the Snake Pit to recognise the 2014 RMC Sandhurst Team. Joining us in beer & pizza were most members of the team, plus the Commandant [B.Gen. A.D. Meinzinger] the College Chief Warrant Office [CPO1 Keith E. Davidson] & the Team Coach [Capt. Trevor Maryyatt]. Bob Harrison congratulated the team on its development effort & success in the competition, while the Commandant & Team Captain [OCdt III Lizée] thanked us for the contributions from the Class of '64. We will see OCdt Lizée at our September pizza lunch as he is the incoming CWC. It was a great lunch & a great chance to meet some truly remarkable young Canadians. Thanks to Brian Cameron for organizing the event & we hope you can join us next year. 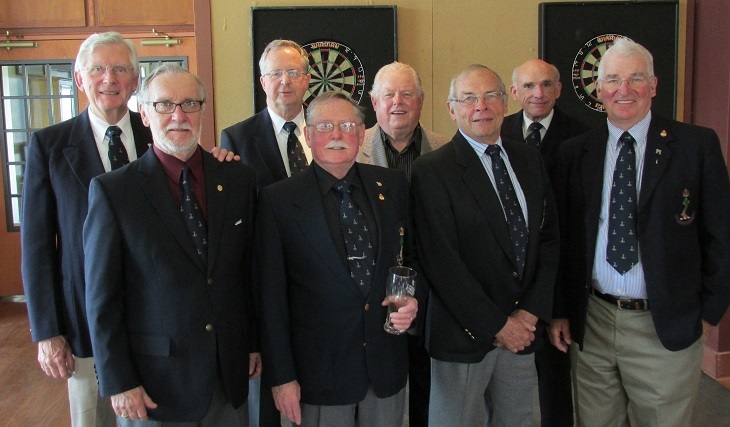 Those present from the Class of '64 were: (left to right) Peter Mace, Jerry Jensen, John Fraser, Lou Grimshaw, Ralph Lamoureux, Bob Harrison, Brian Cameron, Hamish Taylor.